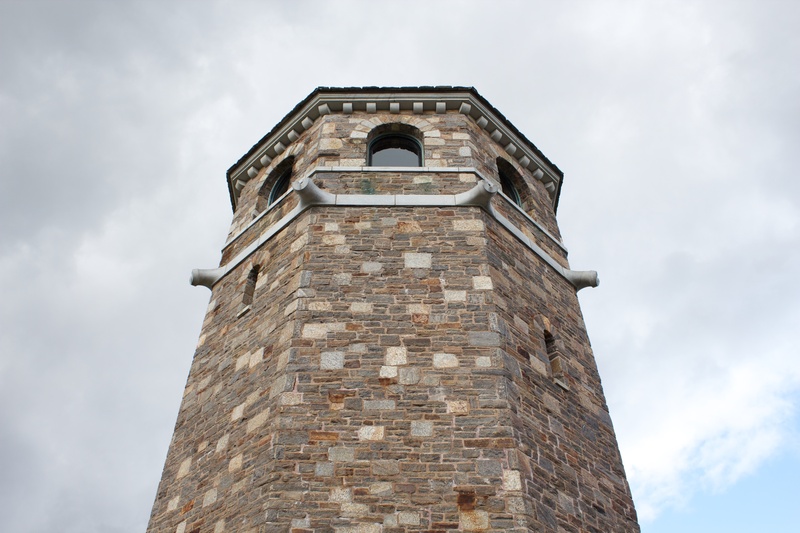 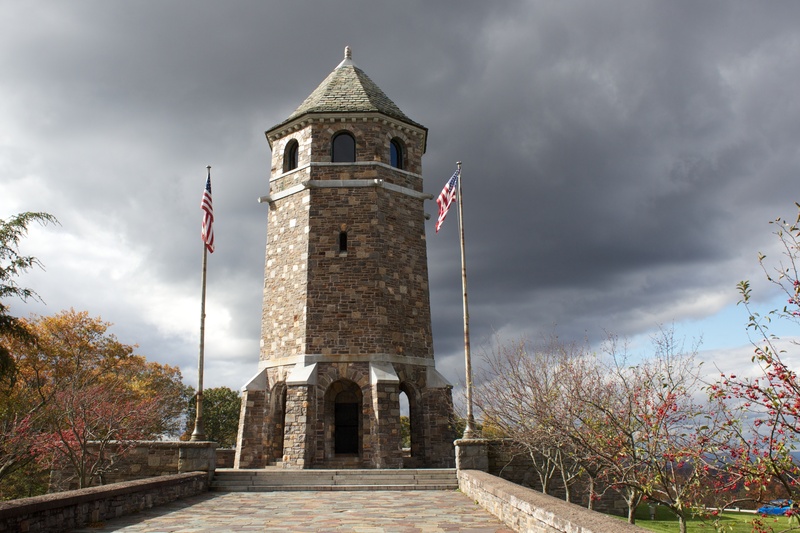 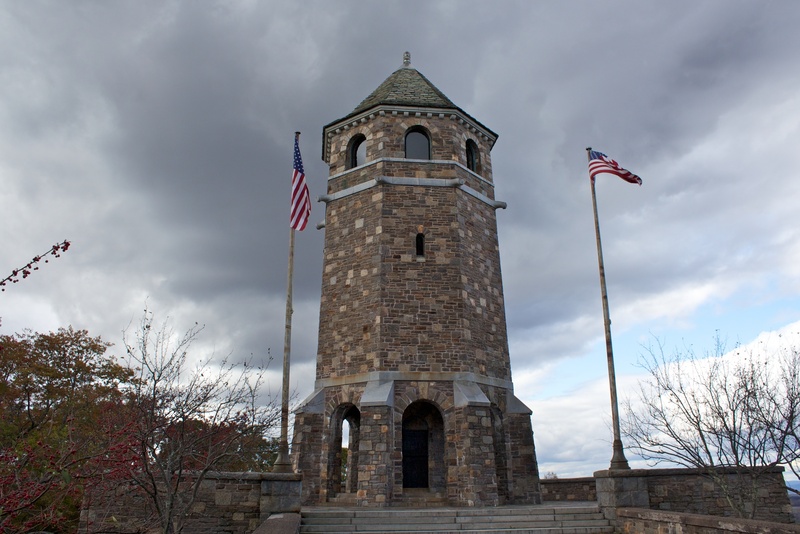 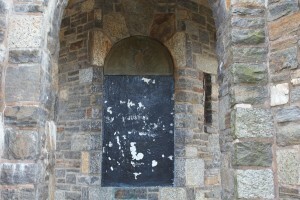 A granite tower in the Rockville section of Vernon honors local veterans of all wars. 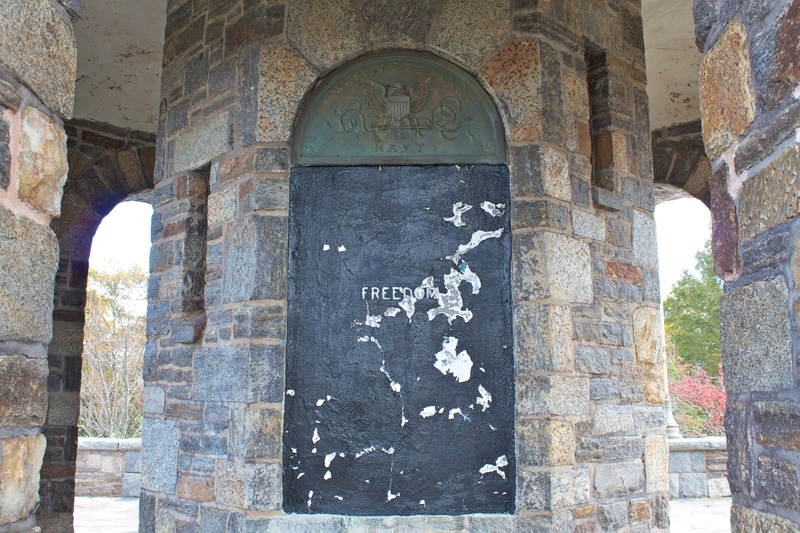 Plaques on the tower’s base honor veterans of the Army, Navy and Marine Corps, and bear the symbols of those service branches. 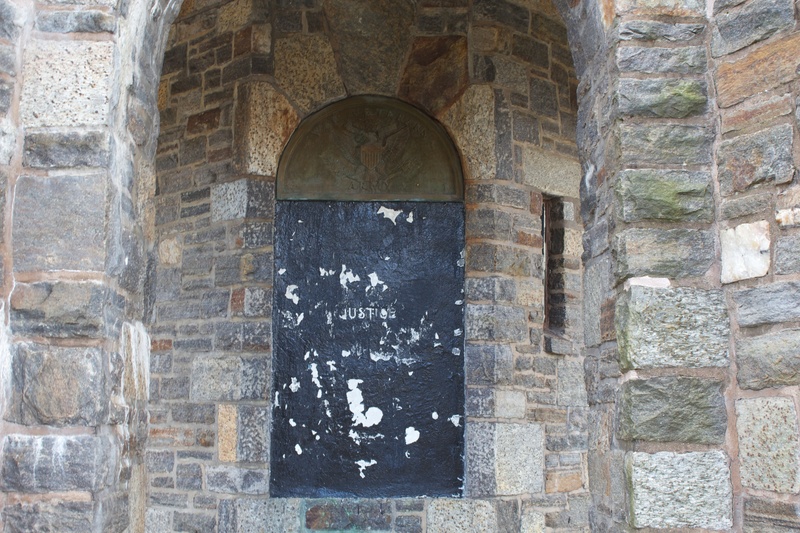 We’re guessing the alcoves underneath the plaques once held markers listing local veterans, but could find no reference to when the plaques may have been removed. 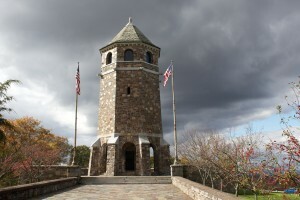 The tower was designed by architect Walter B. Chambers, whose works include two buildings on Yale’s Old Campus and a number of New York City buildings, and was modeled after a 1,500-year-old tower in France. 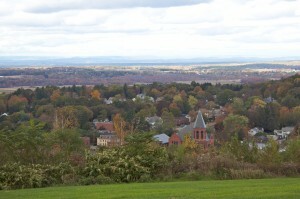 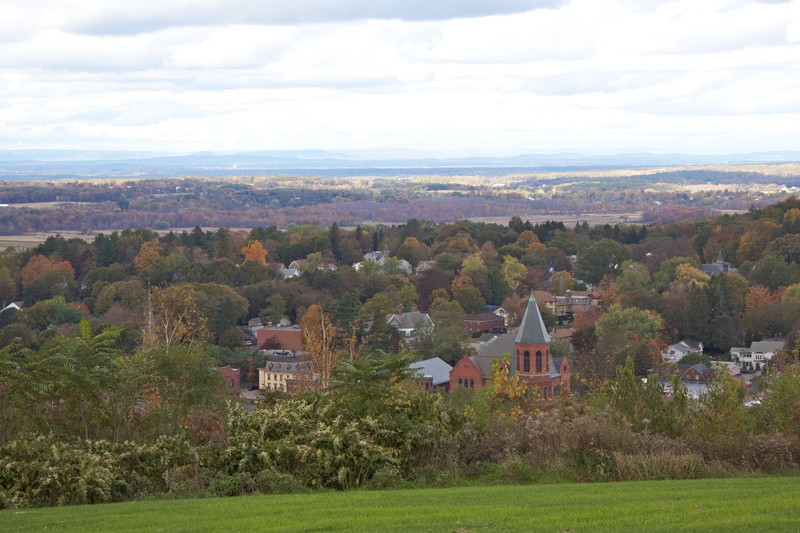 The site offers nice views of downtown Rockville and, on a clear day, as far as Mount Tom and Mount Holyoke. In the center foreground of our picture of the view, you can see Rockville’s 1890 Memorial Building, which was dedicated to honor local Civil War veterans. 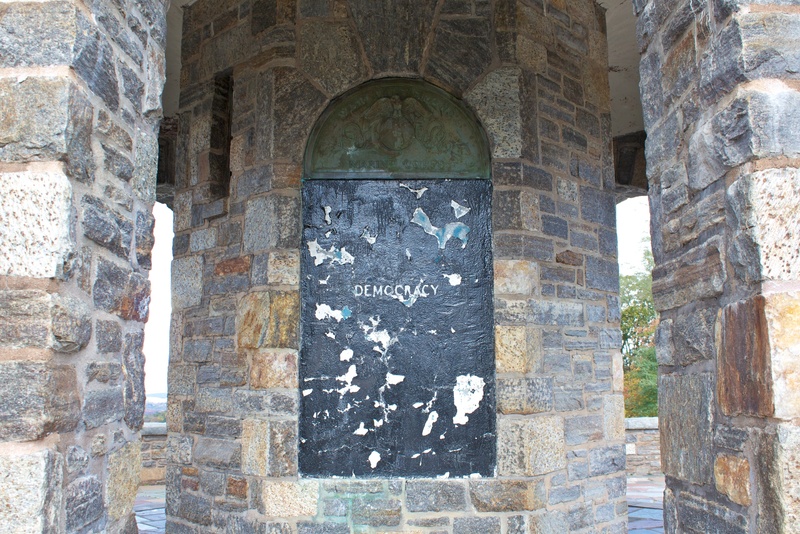 Henry Park was donated to Vernon by E. Stevens Henry, a businessman and politician who served as mayor of Rockville, and was also elected to several state offices and the U.S. Congress. A brownstone monument in the Talcottville section of Vernon honors eight local residents who died during Civil War service. 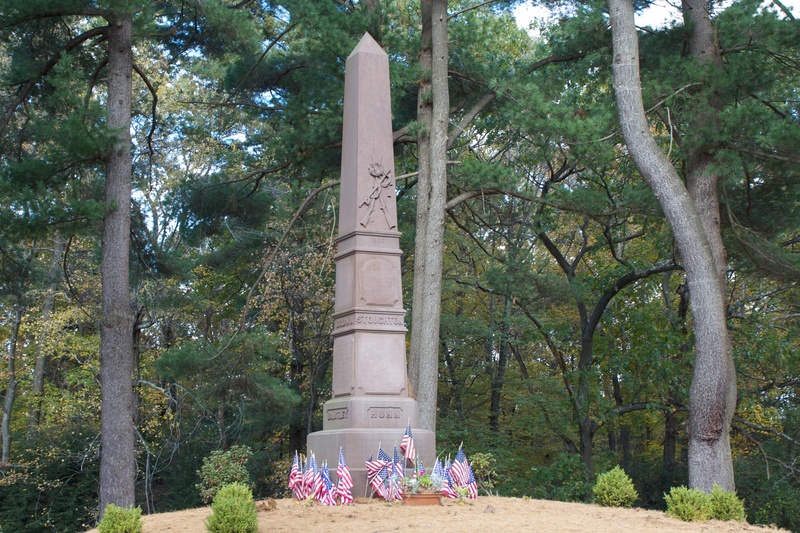 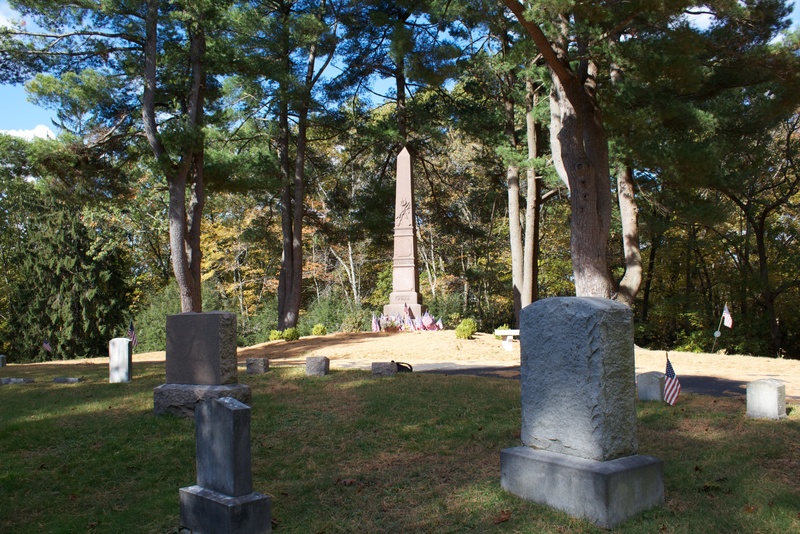 The monument, in Mount Hope Cemetery, was dedicated in 1869 and restored in 2008. 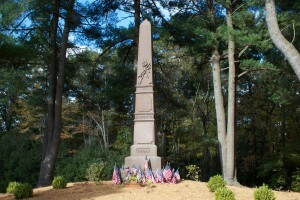 The monument stands on a hill near the cemetery’s Elm Hill Road entrance. 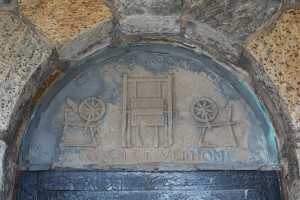 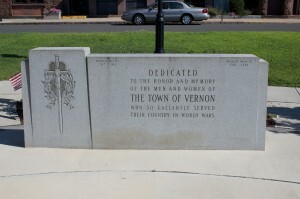 The south face also honors two Vernon residents who died during in the war. 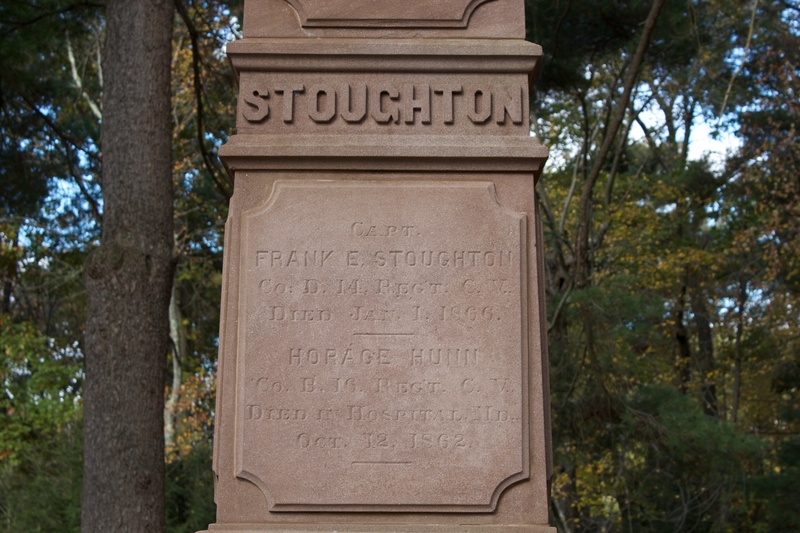 Frank E. Stoughton, who served in the 14th Regiment of the Connecticut Volunteer Infantry, enlisted in July of 1862 and was wounded during the Battle of Gettysburg. 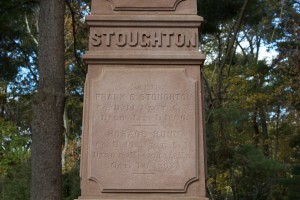 Stoughton was discharged due to disability in 1865, and died on January 1, 1866. Horace Hunn, who served in the 16th Regiment, was wounded during the Battle of Antietam and died in a hospital on October 12, 1862. 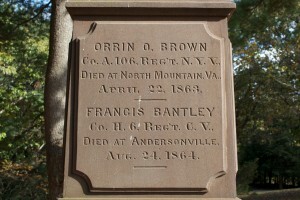 He is buried in the Antietam National Cemetery. 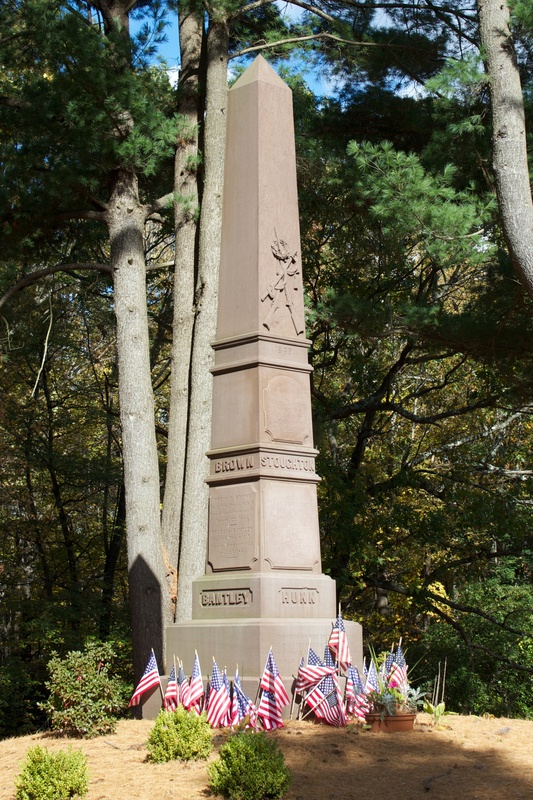 The 16th Regiment was formed in July of 1862 and left for Washington on August 29, 1862. The regiment saw its first action during the Battle of Antietam when the unit, barely trained, fought in the 40-Acre Cornfield. 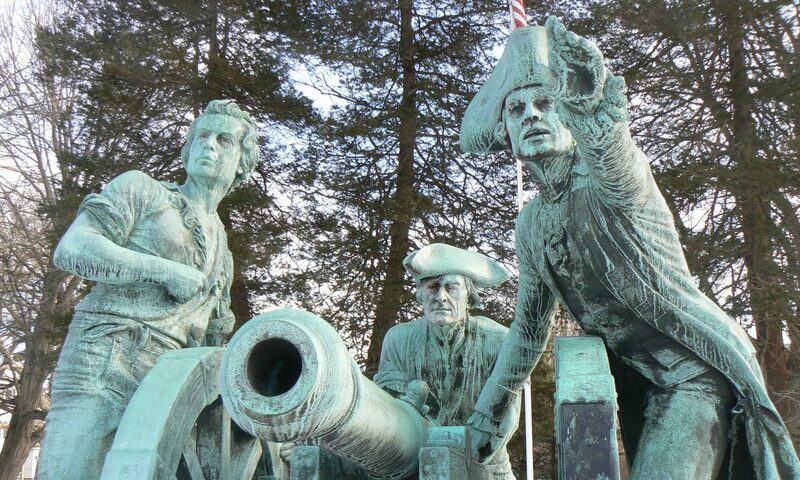 The 16th sent 779 men into combat, and 43 were killed and 161 were wounded. 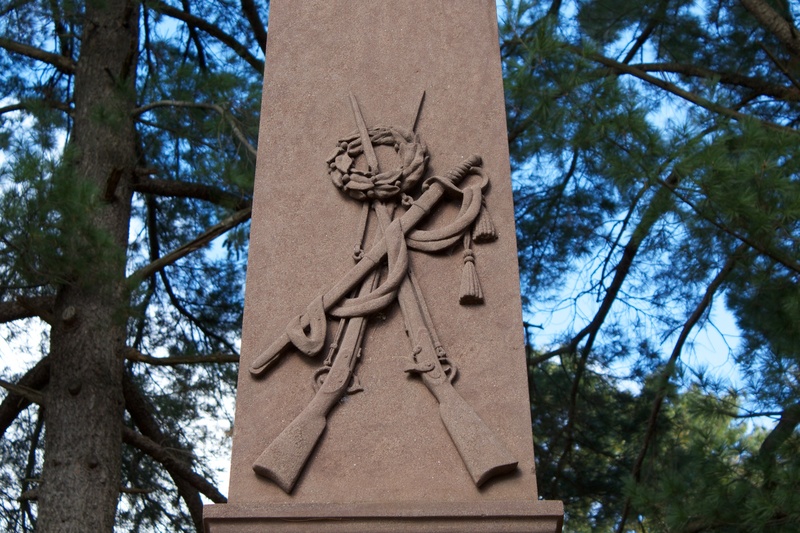 A monument honoring the regiment was dedicated on the Antietam battlefield in 1894. 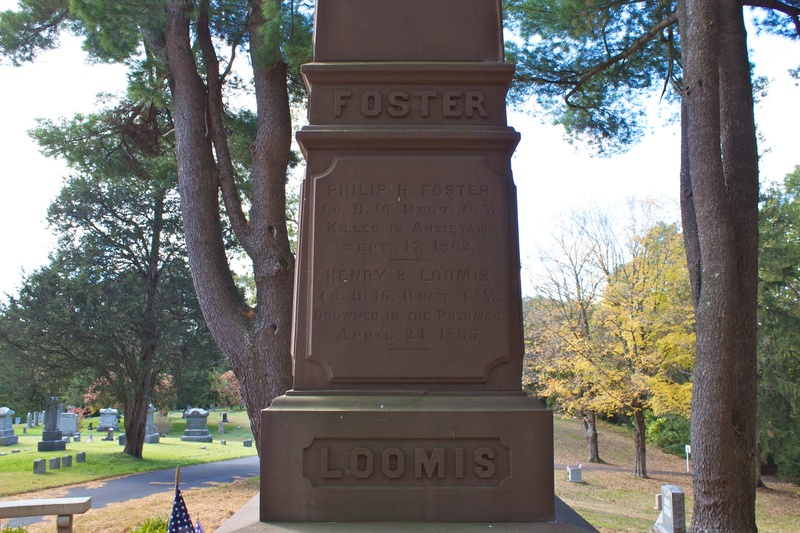 The east face of the Talcottville monument honors Philip F. Foster of Vernon, another member of the 16th Regiment killed at Antietam. 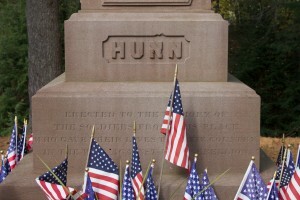 Like Hunn, Foster is buried in the Antietam National Cemetery. 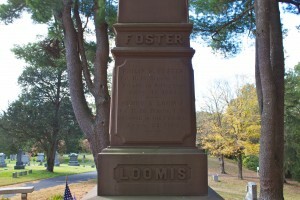 The east face also honors Henry S. Loomis of Vernon, who drowned in the Potomac on April 24, 1865 (a little over two weeks after Lee’s surrender at Appomattox). 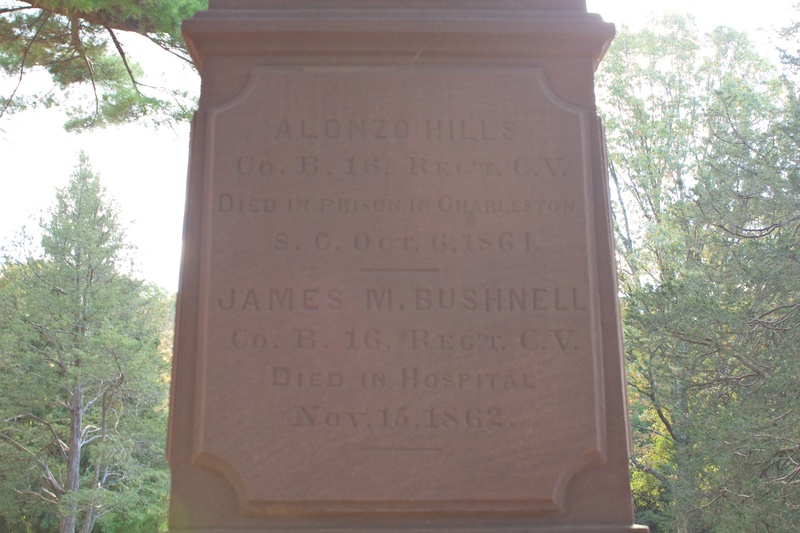 The north face honors two other members of the 16th Regiment: Alonzo Hills, who died as a prisoner of war in Charleston, South Carolina, on October 6, 1864; and James Bushnell, who died in a hospital on November 15, 1862. 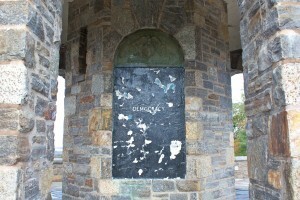 The west face honors Orrin O. 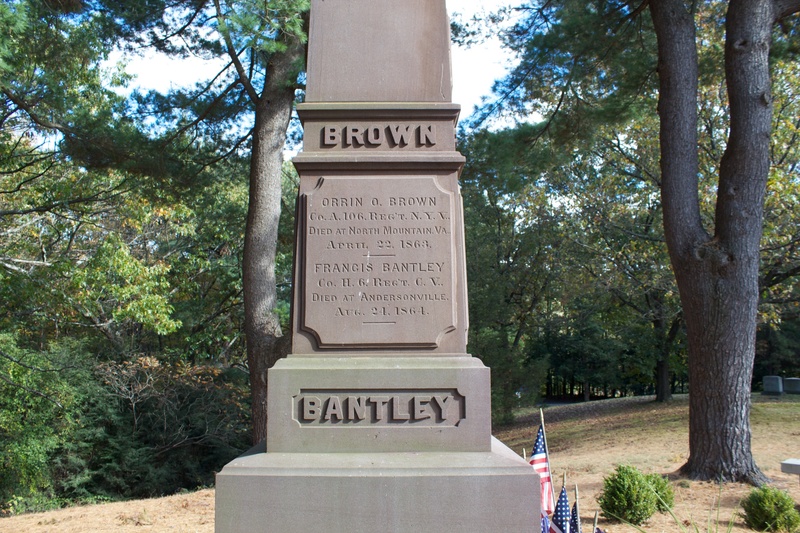 Brown, who served with the 106th Regiment of the New York Volunteer Infantry. 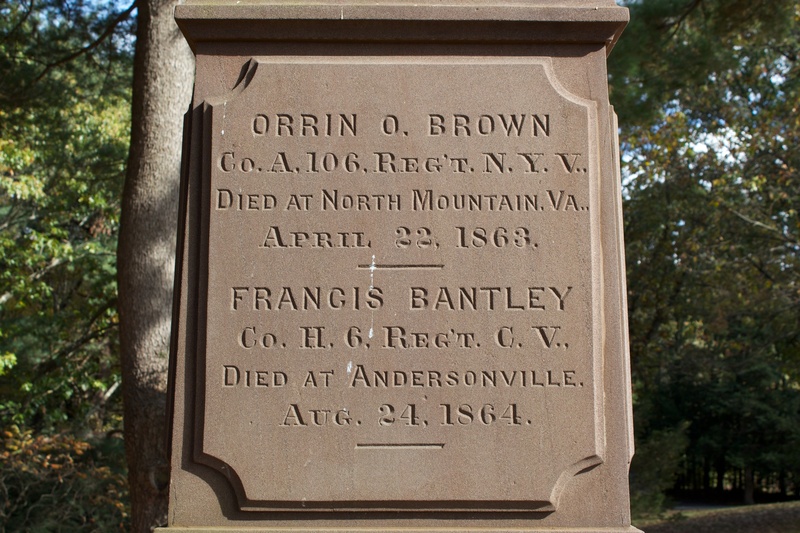 Brown died on April 22, 1863, while serving as part of a garrison protecting the Baltimore and Ohio railroad from Confederate raids in western Virginia. The west face also honors Frances Bantley, a member of the 6th Regiment of the Connecticut Volunteer Infantry. Bantley died in the Confederate prisoner of war camp at Andersonville, Georgia, and is buried in the National Cemetery there. 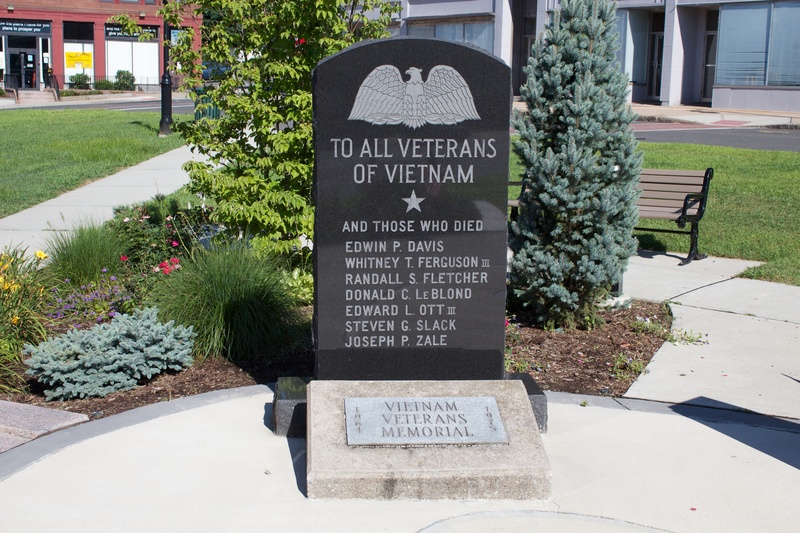 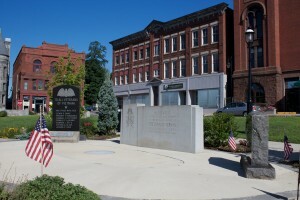 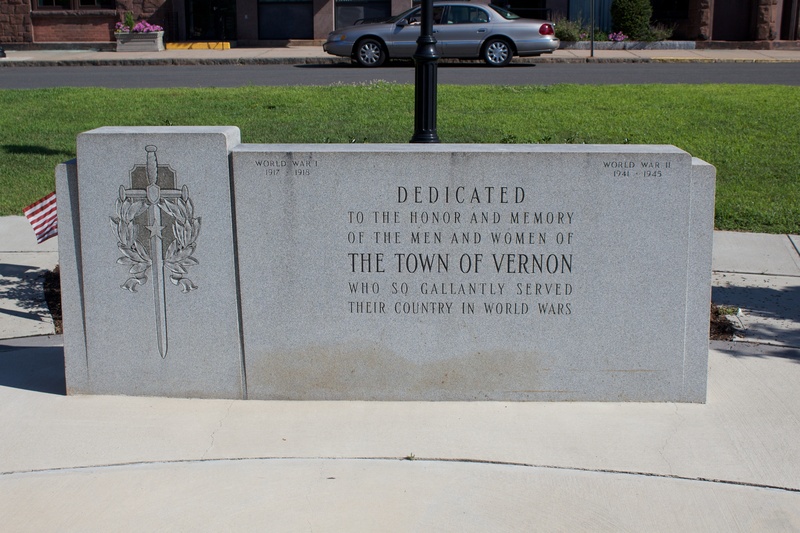 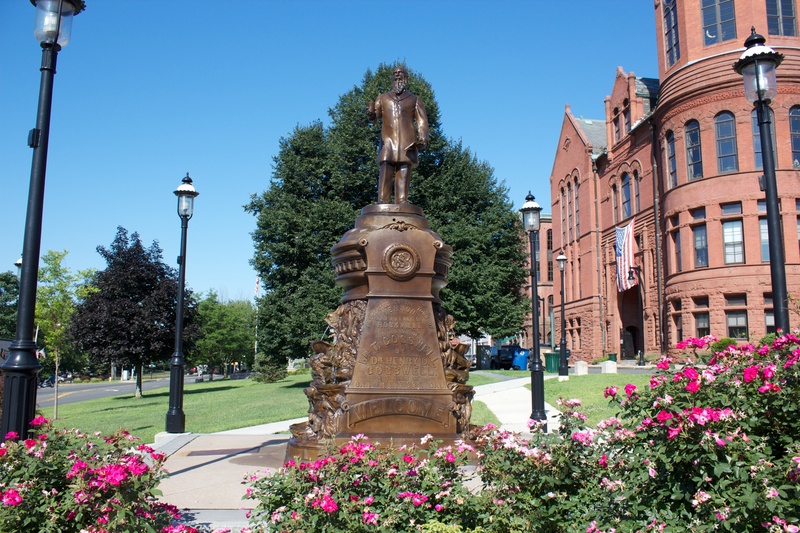 Vernon honors its veterans with a memorial hall and several monuments in the heart of its Rockville section. 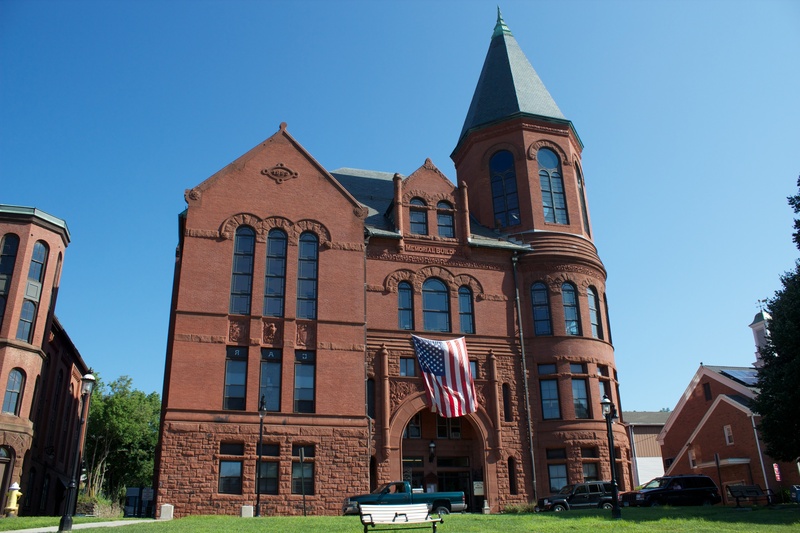 Construction began for Memorial Hall in 1889, and the building was finished a year later. 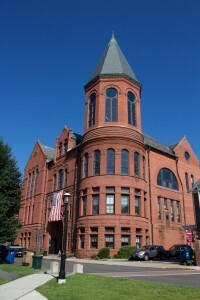 The building originally contained a meeting hall for the local Grand Army of the Republic chapter, a courtroom and municipal offices. 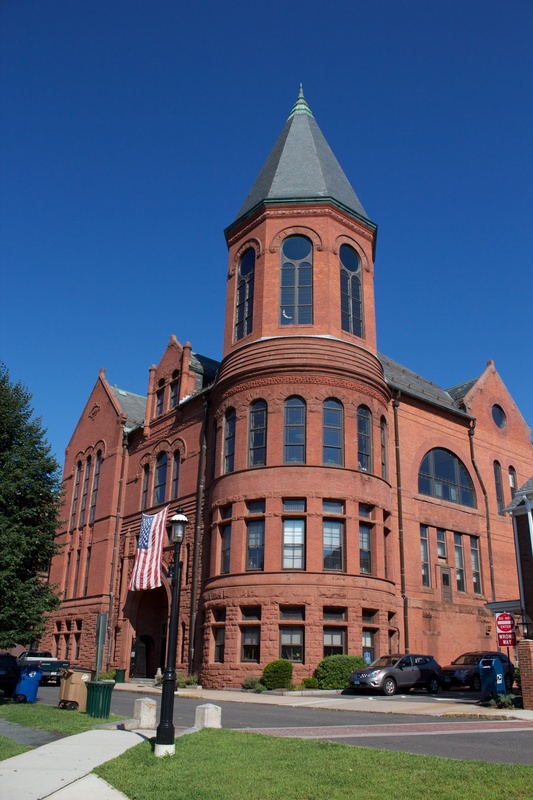 Today, the former GAR meeting space is largely occupied by the New England Civil War Museum (which we’ll highlight in a future post), and the building continues to host municipal offices and a legislative chamber. 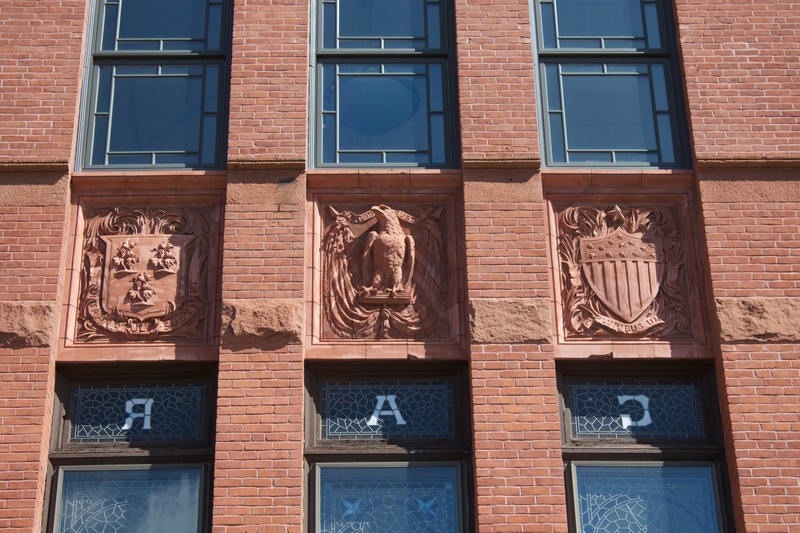 The brownstone and brick building, on Park Street, features a number of large arched windows and ornamental details. The west side of the Memorial Building, for example, includes large stained glass windows on the second floor. 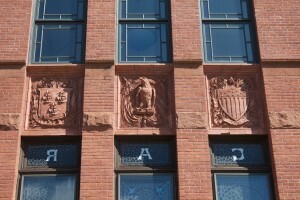 The windows are topped on the exterior with brownstone insets displaying an eagle flanked by the Connecticut and United States shields. 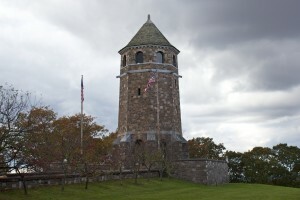 The southeast corner features a tower topped by a turret with large windows and copper ornamentation at its peak. 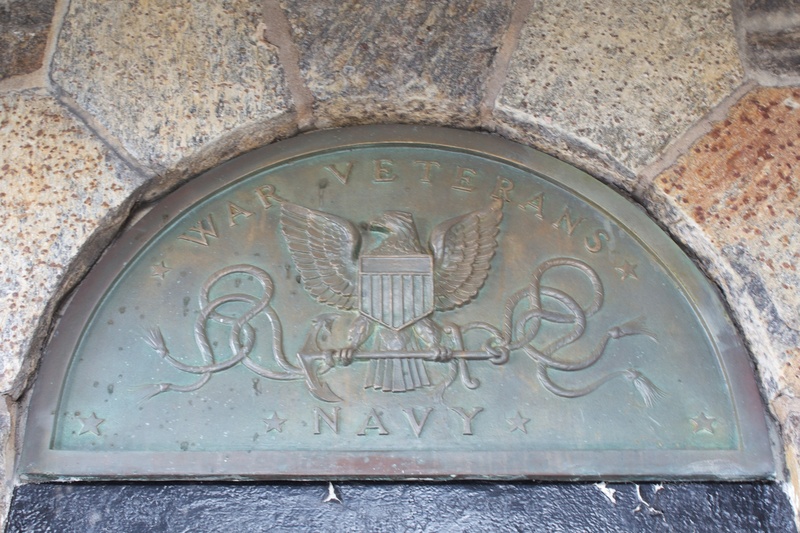 A smaller United States shield can be seen near the archway over the building’s front entrance. A plaque in the building’s lobby commemorates Rockville native Gene Pitney, a singer and songwriter who was inducted into the Rock & Roll Hall of Fame in 2002. 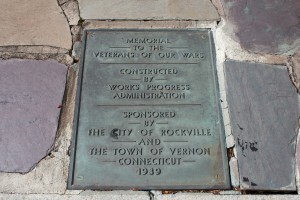 Immediately across Park Street from the Memorial Building, a collection of monuments honor Vernon’s veterans of the World Wars, Korea and Vietnam. To the west of the World War memorial, a monument honors Vernon residents who served in Vietnam. 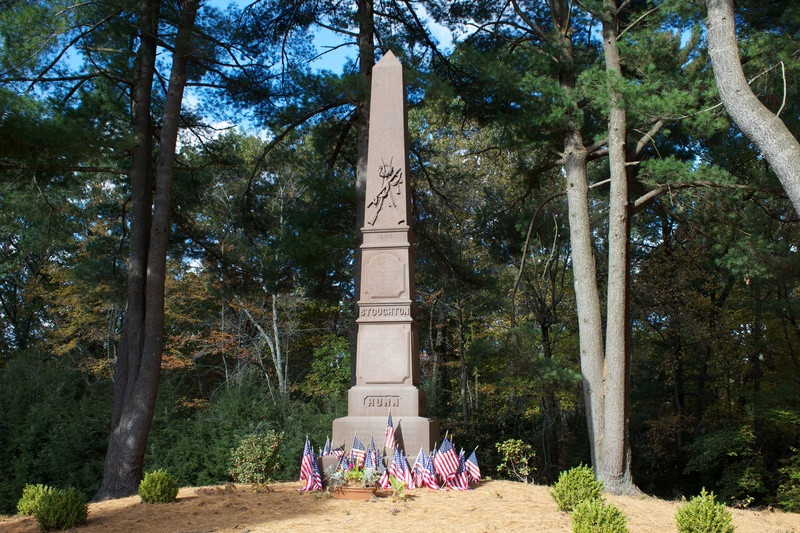 The granite monument bears the names of seven residents who died in the war. 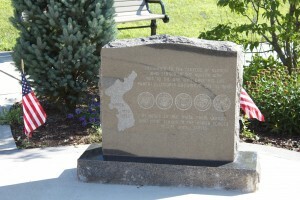 To the east, a monument honors Vernon’s Korean War veterans, and commemorates one resident killed during the conflict. 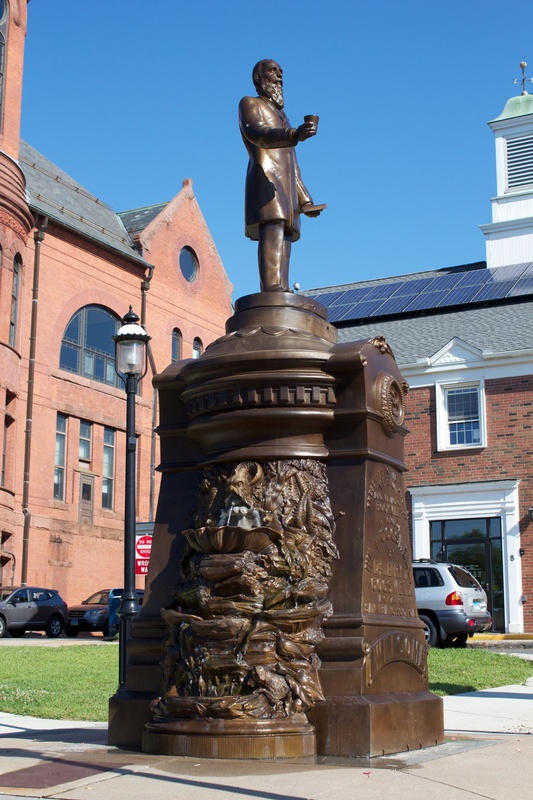 At the eastern end of the park, a fountain honors William T. Cogswell, a 19th century builder who published a history of Rockville in 1872. 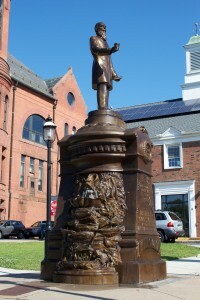 The memorial is a 2005 copy of a fountain erected in 1883 by Cogwell’s cousin, a San Francisco dentist, investor and ardent temperance advocate. 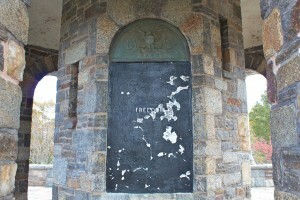 The San Francisco Cogswell erected at least nine fountains in different cities depicting himself, and inscriptions on the base advocated temperance. 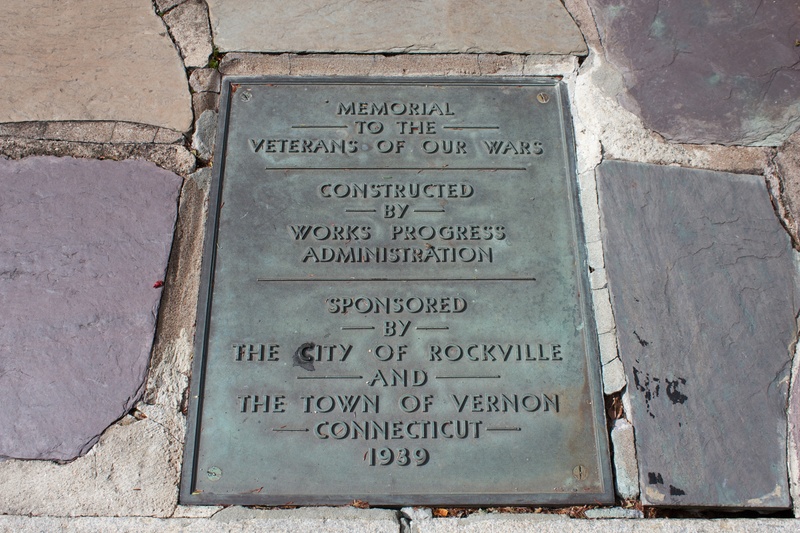 Within two years of its dedication, the Rockville fountain had been stolen and dumped in a local lake. 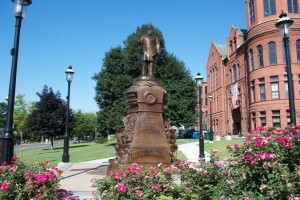 The fountain was recovered, stolen and recovered again before being donated to a World War II scrap metal drive.